Refractories are those materials which have high melting points and have properties which make them suitable to act as heat resisting barriers between high and low temperature zones. Refractories are inorganic, nonmetallic, porous and heterogeneous materials composed of thermally stable mineral aggregates, a binder phase and additives. The general requirements of refractories include (i) ability to withstand high temperatures and trap heat within a limited area such as a furnace, (ii) ability to withstand action of liquid metal, hot gasses and liquid slag by resisting erosion and corrosion etc. (iii) ability to withstand load at service environment, (iv) ability to resist contamination of the material with which it comes into contact, (v) ability to maintain necessary dimensional stability at high temperatures and after/during repeated thermal cycling, and (vi) ability to conserve heat. Important properties of refractories include chemical composition, bulk density, apparent porosity, apparent specific gravity and strength at atmospheric temperatures. These properties are frequently among those which are used as ‘control points’ in the manufacturing and quality control process. The chemical composition serves as a basic for classification of refractories and the density, porosity and strength are influenced by many other factors. Among these are type and quality of the raw materials, the size and fit of the particles, moisture content at the time of pressing, pressure at mould, firing temperature, duration of firing, and the rate of cooling. Properties of the refractories can be classified to resist four types of service stresses namely (i) chemical, (ii) mechanical, (iii) thermal, and (iv) thermo-technical. A suitable selection of the refractories for the furnace lining can only be made with an accurate knowledge of the refractory properties and the stresses on the refractories during service. The relationship between service stresses and important properties of the refractories are at Tab 1. Chemical composition – The chemical composition of refractories is of great importance with respect to attack by liquid slags, flue dusts, glass melts and vapours. Based on the behaviour during contact reactions, the refractories can be categorized as (i) acid refractories (silica, silicon carbide, zircon cristobalite, and zircon silicate etc. ), (ii) basic refractories (dolomite, magnesite, chrome magnesite, magnesite chrome, and forsterite etc. ), and (iii) neutral refractories (alumina, carbon, fire clay, and chromite etc.). Chemical analysis of different refractories can be carried out by methods described in various standards. Mineralogical composition and crystal formation – The behaviour of refractories during their use also depends on the type of raw materials used and on the reactions achieved during firing of the refractories. A glassy phase is more susceptible to attack by slag than a tightly interlocked lattice structure. Aggregate of small crystals can be dissolved and transformed more rapidly by infiltrating substances than closed crystalline materials. Two methods are normally used to recognize mineralogical composition. In the first method a polarizing microscope or a scanning electron microscope is used to identify the crystal structure while in the second method the crystalline phases are examined by X-ray examination or by X-ray diffraction analysis. Pore size distribution and types of pores – The mechanical strength of refractories is largely determined by the true porosity. Porosity is a measure of the effective open pore space in the refractory into which the liquid metal, slag, fluxes, gasses, and vapours etc. can penetrate and thereby contribute to eventual degradation of the structure. The porosity of refractory is expressed as the average percentage of open pore space in the overall refractory volume. Other important properties, such as the behaviour during chemical attack by slags, glass melts, gasses and vapours are influenced by the size, shape, number and distribution of the pores. Hence, both the pore size as well as distribution of pores is important. True porosity of refractory bricks is composed of closed pores and open pores. The open pores can be either permeable or impermeable. The content of open pores is determined by water absorption while the pore size distribution is determined by forcing mercury in the brick sample with the help of a pressure porosimeter. Gas permeability – Gas permeability describes the property of a solid porous refractory to allow gas to flow through in from one direction under the influence of a pressure gradient. The gas flow can be carried out by means of a pressure or suction pump. The methods of determination of gas permeability are described in various standards. The dimension of gas permeability is sq cm or Perm. As this unit is rather large, the dimensions terms where these units are divided by 10 to the power nine are normally used. Resistance to slag, glass melts, gasses, and vapours – The slag resistance characterize the resistance of refractories to chemical attack of any type, including that of glass and vapours. The destructive agents coming into contact with refractories are of different composition and the destruction processes are correspondingly many. The method of determination of slag resistance is described in various standards. Refractory brick destructions are not only caused by liquid slags and glass melts but gasses and vapours also influence the service life of the refractory bricks due to several individual reasons. Cold crushing strength – The cold crushing strength determines the ability to withstand the rigorous of transport and handling before the installation of refractories in the furnace. It can be seen as a useful indicator to the adequacy of firing and abrasion resistance in consonance with other properties such as bulk density and porosity. The cold crushing strength is determined by the methods described in various standards. In order to evaluate the behaviour at the service temperatures, the hot crushing strength is also sometimes determined in addition to the cold crushing strength. Abrasion resistance – The mechanical stress of refractories is not caused by the pressure alone, but also by the abrasive attack of the solid charge materials as they slowly pass over the brickwork inside the furnace. The mechanical stress can also be due to the impingement of the fast moving gasses loaded with fine solid dust particles. The abrasive stress is quite well simulated by Bohme’s grinding machine, but the results normally cannot be applied to the conditions existing in the furnaces being operated at high temperatures, especially when the strength of the refractory brick is getting changed due to the chemical influences. There is presently no approved measuring method available for measuring abrasion resistance, and the abrasion factor according to Bohme is still being used as a reference value. Cold modulus of rupture and deformation modulus – Due to the thermal stress, generally combined with altered physical- chemical conditions because of infiltrations, strain conditions occur in the refractory brickwork which can lead to rupture and crack formation. In order to determine the magnitude of the rupture stress, the resistance to deformation under bending stress, i.e. rupture strength is measured. Because of their heterogeneous coarse ceramic structure, refractory bricks are purely elastic within a narrow deformation region. The ratio of stress of deformation within this purely elastic initial region, where the deformation is still reversible, is described as the modulus of elasticity. This is normally measured dynamically by means of ultrasonic or resonance frequency. Progressive deformation up to rupture is outside the purely elastic region with the deformations on the less resistant fines content and for this reason the stress increases more slowly relative to the deformation. Then the modulus of elasticity is no longer sufficient to calculate the stress which occurs. Hence, the ratio of rupture stress to rupture deformation has been introduced as the modulus of deformation. In case of refractories this modulus is smaller than or at the most equal to the modulus of elasticity. The determination of the modulus of deformation in cold condition is carried out, together with the modulus of rupture, on a test bar resting on two bearing edges and applying a load to the centre of the bar. Porosity and density – Low porosity of the refractory brick is desirable since it improves the mechanical strength and other properties of the refractories. True porosity of a refractory brick is the ratio of the total pore space (i.e. open and closed pores) of a body to its volume and is expressed in volume percent. The formula for true porosity is as follows. True porosity = (S- R)/S X 100 volume %, where S is the density and R is the bulk density. The density is the quotient of mass and volume excluding pore space and is determined on finely crushed material. Frequently, not the values of the true porosity but those of apparent porosity (open porosity) are used as the application property. The apparent porosity includes only those holes which can be infiltrated by water and not the closed holes. High porosity materials tend to be highly insulating as a result of high volume of air they trap, since air is a very poor thermal conductor. As a result, low porosity materials are generally used in hotter zones, while the more porous materials are usually used for thermal backup. Such materials, however, do not work with higher temperatures and direct flame impingement, and are likely to shrink when subjected to such conditions. Refractory materials with high porosity are usually not chosen when they are to be in contact with liquid slag since they can be penetrated as easily. The bulk density is generally considered in conjunction with apparent porosity. It is a measure of the weight of a given volume of the refractory. For many refractories, the bulk density provides a general indication of the product quality. It is considered that the refractory with higher bulk density (low porosity) is better in quality. This is because an increase in bulk density increases the volume stability, the heat capacity, as well as the resistance to abrasion and slag penetration. 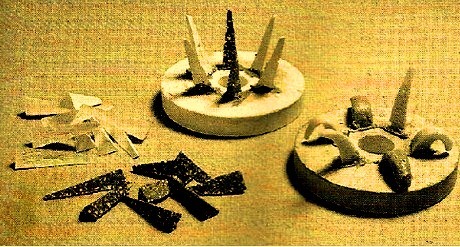 Pyrometric cone equivalent – Refractories due to their chemical complexity melt progressively over a range of temperature. The refractoriness of the refractories is one of the most important properties of the refractory. As the refractories hardly ever consist of a single compound, reference is made, not to a specific melting point, but to a softening region. This is determined with the help of comparative ceramic samples of known softening behaviour usually known as ‘Seger cones’ (Fig 1). Pyramids are cut from the refractory bricks which are to be tested. The method of testing is described in various standards. The equivalent standard cone which melts to the same extent as the test cone is known as the pyrometric cone equivalent (PCE). The cone values reported for refractories are based on a defined standard time – temperature relationship, so different heating rates result in different PCE values. Refractoriness under load – Refractoriness points to the resistance of extreme conditions of heat (temperature more than 1000 deg C) and corrosion when hot and liquid materials are contained while being transported and/or processed. The ability to withstand exposure to higher temperatures without undergoing appreciable deformation is measured in terms of refractoriness. The tests for refractoriness under load serve to evaluate the softening behaviour of fired refractory bricks at rising temperature and under constant load conditions. The softening behaviour under load is not identical to the melting range of pure raw materials, but is influenced by the content and the degree of distribution of the low melting point flux agents. The refractoriness under load test provides an indication of the temperature at which the refractory bricks collapse, in service conditions with similar load. However, under actual service where the bricks are heated only on one face, most of the load is carried by the relatively cooler rigid portion of the bricks. Hence the refractoriness under load test gives only an index of the refractory quality, rather than a figure which can be used in a refractory design. Under service conditions, where the refractory used is heating from all sides such as checkers, partition walls, etc. the test data is quite significant. Refractoriness under load (differential) – In order to eliminate errors as a result of the inherent expansion of the test equipment when the refractoriness under load is being tested, and to enable tests to be carried out in an oxidizing atmosphere, a different method has been developed to determine the resistance at rising temperature and constant load which is the refractoriness under load (differential) test. In this method same type of samples are used as for the refractoriness under load test bur they have an internal bore to permit rods to be fitted to the upper and the lower sides. With this method, temperature values are obtained by differential measurements in an oxidizing atmosphere and these values are considerably lower than the refractoriness under load values. Thermal expansion under load (creep) – Refractory materials must maintain dimensional stability under extreme temperatures (including repeated thermal cycling) and constant corrosion from very hot liquids and gases. The thermal expansion under load (creep) of refractory bricks, which are heated evenly on all sides over a long period during service, can be tested by a long term test called creep under load. It is a time dependent property which determines the deformation in a given time and at a given temperature by a material under stress. The test is conducted as described in the various standards. For this, the sample of 50 mm diameter and 50 mm height, with an internal bore for the measuring rod, is heated at a constant speed and under a given load (normally 0.2 N/sq mm) and is normally held for 10 hours to 50 hours under constant load after the required test temperature has been reached. The compression of the sample, after maximum expansion has been attained, is given in relation to the test time as a measure of creep at a specified test temperature. Hot modulus of rupture – Hot modulus of rupture is the resistance to bending stress at high temperature. The resistance to bending stress of refractory products provides information on their deformation behaviour at high temperatures. The test samples are bars which are heated in electric chamber kilns. For the test, the bars are placed on bearing edges of the kiln and are stressed until fracture occurs at the test temperature by applying an increasing load to the centre of the bar. Thermal expansion – All materials experience a change in volume under the influence of temperature. The contraction or expansion of the refractories can take place during service. Such permanent changes in dimensions may be due to (i) the changes in the allotropic forms which cause a change in specific gravity, (ii) a chemical reaction which produces a new material of altered specific gravity, (iii) the formation of liquid phase, (iv) sintering reactions, and (v) may happen on account of fluxing with dust and slag or by the action of alkalis on fireclay refractories, to form alkali-alumina silicates, causing expansion and disruption. The reversible linear expansion curve of most of the refractory bricks is more or less straight although the absolute amount varies considerably. Silica bricks, however, have an irregular and strong thermal expansion in the temperature range of up to 700 deg C. By changes in structure or in firing methods of refractory bricks, the expansion curve can be influenced within certain limits. Bricks with high expansion are very susceptible to thermal shock. Thermal expansion is important in service, as the effects of expansion are to be taken into account during the installation of refractory lining. If not done, then edge pressure and premature spalling of the bricks take place. Reheat change (after shrinkage and after expansion) – After heating to high temperature and subsequent cooling, a permanent change in the dimension (permanent linear change) often occurs which is described as after expansion or after shrinkage. If a refractory brick has very strong after shrinkage then the joints get enlarged and the brickwork is loosened and no longer tight. In opposite case, after expansion is also dangerous since this can cause the destruction of the brickwork through pressure. The permanent linear change (PLC) of the refractories can be influenced. For obtaining a brick with a constant volume, the burning of the raw materials and the firing of the bricks is to be controlled in such a manner so that equilibrium is achieved at the desired temperature. Thermal shock resistance – Thermal shock resistance is one of the most important service properties. It characterizes the behaviour of refractories to sudden temperature shocks which occurs very often during the furnace operation. Temperature fluctuations can reduce the strength of the brick structure to a high degree and can lead to disintegration or spalling in layers. There are two standard methods for the testing of the thermal shock resistance. They are (i) water quenching method, and (ii) air quenching method. In the water quenching method, the test piece is a standard cylinder which is heated to 950 deg C and then quenched in running cold water. The test is repeated till the destruction of the sample but not more than 30 times. The number of quenching till destruction determines the thermal shock resistance. Air quenching method is used for bricks which are susceptible to hydration. The process in this method is same except that the quenching is done by blowing compressed air in place of running water. The thermal shock resistance of refractories often decreases with increasing firing levels. Those refractories which retain their quenching resistance even after higher firing temperatures or service temperatures are the most useful in practice. Specific heat – Specific heat is a temperature and material related energy factor and is determined with the help of colorimeters. This factor indicates the amount of energy (joules) required to raise the temperature of 1 gram of a material by 1 degree kelvin. Compared to water, the specific heat of refractories is very low. Bulk density – In order to know the stored heat, it is necessary to know the bulk density of the refractories. The term bulk density describes the measure of mass and volume including the pore space. Bulk density is generally considered in conjunction with apparent porosity. It is a measure of the weight of a given volume of the refractory. For many refractories, the bulk density provides a general indication of the product quality. It is usually considered that refractories with higher bulk density (low porosity) are better in quality. An increase in bulk density increases the volume stability, the heat capacity, as well as the resistance to abrasion and slag penetration. Bulk density is by far one of the most important characteristics and serves, together with the density, to calculate the true porosity and, together with water absorption, to calculate the apparent porosity. Thermal capacity and temperature conductivity – Thermal capacity can be calculated from the specific heat and the bulk density. The following formula gives the heat stored (W) in one square meter of refractory wall of thickness‘s’. Where W is stored heat in kJ/sq m, R is bulk density of brick in kg/cu m, Cpm is mean specific heat of the refractory bricks between the temperatures T1 and T2 in kJ/kg*K, s is wall thickness in meters, T1 is the inside temperature of furnace wall in deg C, and T2 is the external temperature of the furnace wall in deg C.
With intermittent heat flow, e.g. checker work, not only the thermal conductivity of the refractories is of interest but also the ratio of the thermal conductivity to the thermal capacity (known as temperature conductivity), is important for the progression of the temperature changes. Melting point – Melting temperatures (melting points) specify the ability of materials to withstand high temperatures without chemical change and physical destruction. The melting point of few elements that constitute refractory composition in the pure state varies from 1700 deg C to 3500 deg C. The melting point serves as a sufficient basis for considering the thermal stability of refractory mixtures and is an important characteristic indicating the maximum temperature of use. Size and dimensional stability – The size and shape of the refractories is an important feature in design since it affects the stability of any structure. Dimensional accuracy and size is extremely important to enable proper fitting of the refractory shape and to minimize the thickness and joints in construction.